eBay eBay Listing Template | Listing template ebay MENU Payment Shipping Feedback Contact Us Watches sunglasses Swiss Army KnivesZIppo lightersbags & wallets FAST Delivery Worldwide shipping Best Price 100% Authentic & Warrantied Invicta 17884 Men's Gold Dial Gold Steel & Rubber Strap WatchInvicta 17884 Pro Diver chronograph men's dive watch features a 48mm wide gold plated solid stainless steel case with a unidirectional rotating rose gold accented gold tone bezel and textured push-pull crown with function pushers. Invicta 17884 is powered by a precise Japanese VD53 quartz chronograph movement. This stylish watch also features a shiny sunray gold tone dial with white accents rose gold tone luminous skeleton hands and dot hour markers along with the chronograph and magnified date display functions, scratch resistant flame fusion crystal and water resistant to 200 meters. 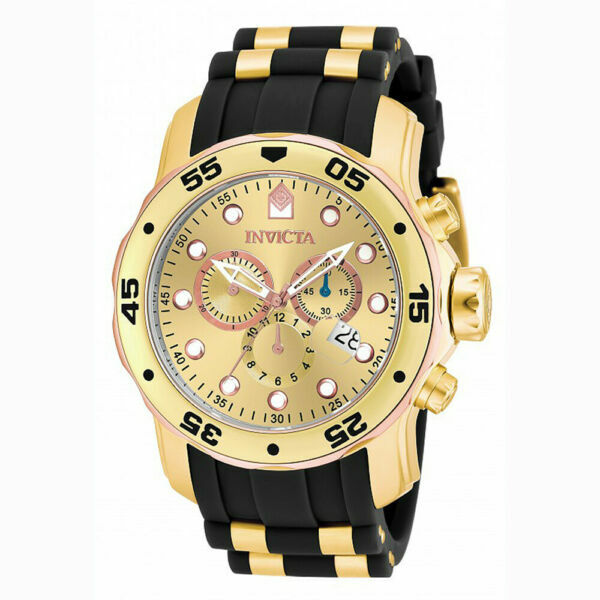 Invicta 17884 is equipped with a 26mm wide gold plated solid stainless steel and black rubber strap with a buckle clasp. Invicta 17884 men's Pro Diver chronograph gold dial gold steel & rubber strap dive watch is brand new and comes in an original Invicta gift box and is backed by a 3 years limited warranty. about us My Gift Stop has been selling brand name gift merchandise online since 2002. We are authorized dealer for many of the brands we carry. We offer a large selection of fine wristwatches, shoes, sunglasses, jewelry, and other gift items at significant savings. Shop confidently with us. Customer satisfaction is a top priority for us. 70,000 plus positive feedback is a testament to that commitment. payment We accept PayPal. Immediate payment is required to purchase this item. We generally ship within 24 hours after the payment is cleared. Note, we prefer to ship to your confirmed PayPal address. If your ship to address is not confirmed, additional verification will be performed and WILL delay the processing of your order. shipping Domestic (Continental US) Please allow 1 to 2 days for processing.Standard Shipping Estimated Delivery Date at the top of the listing is an estimate calculated by eBay based on our shipping record. However, it is not a guaranteed that you will receive your order on this date. Actual delivery will vary by generally happens between 2 and 7 business days for Standard Shipping. If you need your order urgently, please choose Expedited or One-Day shipping. InternationalInternational customers please click the Shipping and payments tab to see shipping rate to your country. We ship via DHL and UPS with 1 to 5 days transit time to most regions of the world. However, at times, at our discretion, we may opt for a different shipping method including, but not limited to, USPS EMS for various reasons.International customers please note the following points:Canada customers, please note that Canada Post may charge a 10 CAD COD fee to collect customs/duty tax payment on your package. We have no control over this fee and this fee is the buyer's responsibility.Unless otherwise specified, customers are responsible for all customs and duty related charges including any brokerage fees charged to clear the package through your country's customs agency.Item must be declared as merchandise and not as gift.Please only submit order if you agree with the above points.International customers please make sure to submit your shipping address in English to facilitate shipping. return policy Purchases may be returned to us within 30 days of receipt in their original, brand new condition (unworn, unmodified, and unsized) with all plastic protectors, tags, and original packaging intact for a refund or exchange.Customer is responsible for the return postage. We recommend sending your return via a traceable service. If a package is returned to us due to your refusal to accept it, the return postage will be deducted from your refund. If the refusal is an international package, original postage, return postage, as well as any customs/duty related expenses will be deducted from your refund.To return your purchase, please email us for a Return number. Returns not accompanied by a return number will be rejected. Domestic returns must be received within 7 business days and international returns must be received within 14 business days after the Return number is issued.All returns are subjected to close inspection. If item shows signs of wear, at our sole discretion, we reserve the right of refusing the return, at which point the item will be returned to you.Note: Personal care items such as fragrances are not returnable once opened. Zippo lighters are also not returnable once the seal on the back of the lighter is broken.